Monday Morning Star Count – on a Tuesday Afternoon | there's no place like gnome. I wasn’t ready to post yesterday morning because, you see, I only finished sewing this baby together last night. And this is it. 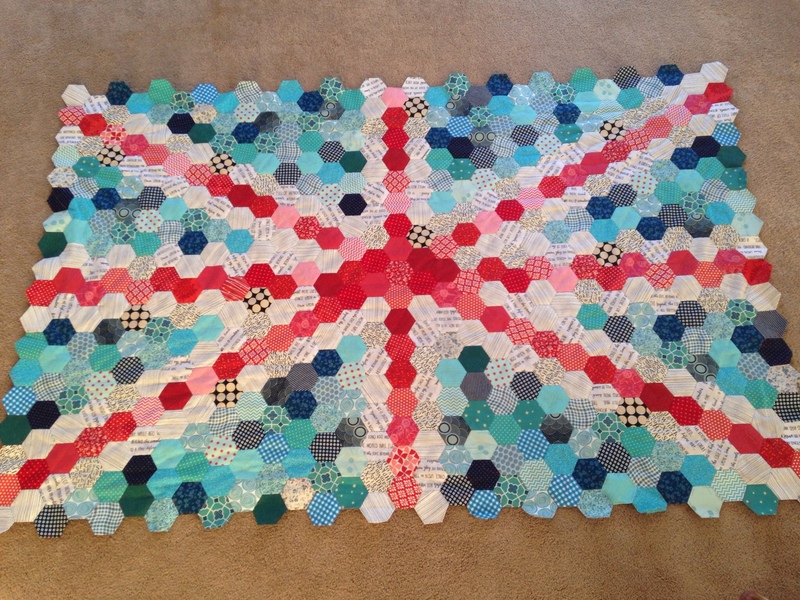 I’m done with the hexie portion of this Union Jack pattern. Over 500 hexies basted and sewn together. It’s been a project on my coffee table since last November; I think I might miss it! Next up: a scrappy triangle border to surround the flag. I started last night and I think it’s going to be a long process. It’s hard to go back to the machine after getting so comfy hand sewing on the couch! It’s also hard since it seems Sherlock is no longer available on Hulu … Sherlock was my watch-over-and-over kind of show. I guess I need a new one. Very nice! I know what you mean about working in hand while watching television.